In a lot of cities and towns across America, some of the best places to grab a bite to eat or throw back a well-made cocktail are those that rely more on word-of-mouth than extremely-overt advertising. Looking for grub and a drink to wash it down with while in Detroit recently, a friend and I stumbled upon just such an establishment. 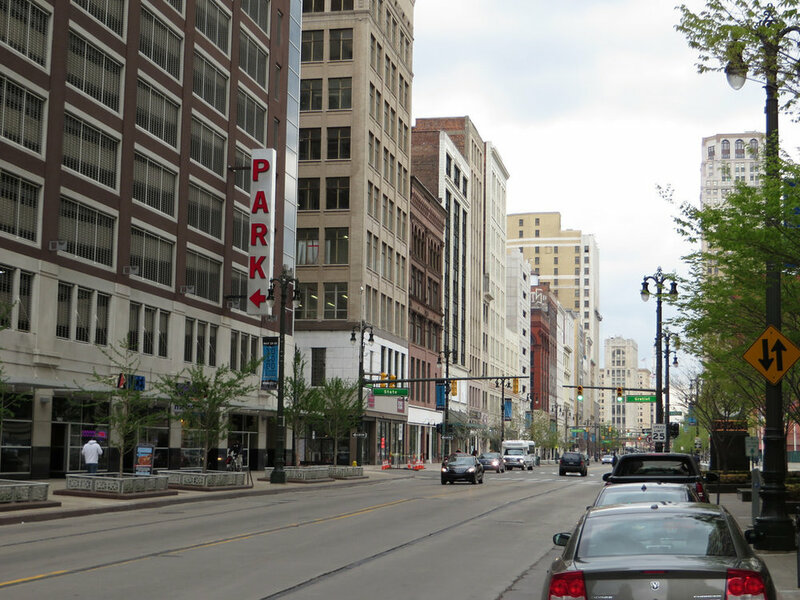 It was while wandering around the confines of Campus Martius Park, scouring mobile webpages on our cellular devices, that the name Wright & Company popped up. Being the piss-poor explorer that I was when I lived in Detroit for the final few months of 2016, I had never heard of the place, but it was practically right around the corner and we thought we'd give it a go. Though housed in the Wright-Kay Building (former home of the Schwankovsky Temple of Music and Wright-Kay Jewelers) on Woodward Avenue, we quickly discovered that you can only gain access to the second floor of the building, where Wright & Co. is located, by slipping through a somewhat nondescript door on John R Street. Once inside, you head up the elevator and enter the establishment, which turns out to be a dimly-lit and eccentrically-decorated gastropub. Offering delectable small plates and a fine dining atmosphere in the heart of downtown, Wright & Co. actually happens to be the vision of Dave Kwiatkowski, the owner and creator of The Sugar House, a craft cocktail bar in Detroit's Corktown, and Marc Djozlija, former executive chef for Wolfgang Puck at the MGM Grand Detroit Casino. Fittingly, then, Wright & Co.'s small plate menu features sophisticated options such as Maine crab cakes, Parisian Gnocchi, and seared scallops, among other fancier-than-thou selections. When we were there, back in October, we opted for a couple snacks — pork belly sliders and what amounts to super-fancy nachos. And while their cocktail menu includes choices like "Kiss at Midnight", a concoction of Plymouth Gin, squid ink, rose hip, blackcurrant, and Campari foam, and "Nomadic Tendencies" (especially appropriate here), which has Rebel Yell Rye, Dr. Bird Jamaican Rum, Aperol, spiced pear, and lemon, I was feeling beer at the time and my friend went for a glass of wine. I cannot, for the life of me, remember exactly what I ordered to drink, but the beer selection is anything but limited. As with the cocktails I just mentioned, the beers on tap at Wright & Co. vary somewhat with the seasons, but you're liable to stumble upon sours, lagers, and darker beers from places like Founders Brewing (Grand Rapids, Michigan), Stillwater Artisanal (Stratford, Connecticut), and from international brewing companies, primarily in Belgium and Germany. Much like Jane Slaughter in her piece on Wright & Co. in the Detroit Metro Times, I have nothing but praise for this unassuming gastropub above the John Varvatos store on Woodward. If you're down for classic architecture and food that is "probably unmatched downtown" (according to Ms. Slaughter's Sept. 2014 write-up, anyway), you can't very well go wrong by stopping here.